If you show films in London or are hoping to, our Exhibitors' Breakfasts are for you. 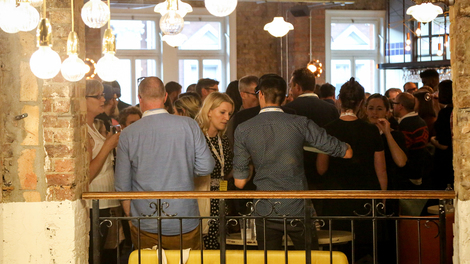 From cinemas, festivals and art centres to local authority Film Officers, film clubs and freelancers, the Breakfasts provide film exhibitors in London with the chance to meet each other. They're an opportunity to share sector news, opportunities, best practice and lessons learnt - developing ways of working together in new and exciting ways. And our Breakfasts have helped build strong partnerships: venues have brought in new festivals, festivals have forged collaborations, and mentoring relationships have developed. The next Exhibitors' Breakfast will take place at Guy's Hospital ICAP MediCinema on Friday 29 March with a focus on community wellbeing. Register now. Our Exhibitors' Breakfasts are part of Film Hub London - a network for organisations showing films across the capital. Membership is free and gives you access to funding opportunities, a range of support and bespoke programmes. Not yet a member? Join Film Hub London now.